All six Grandes Etudes de Paganini are a comparative rarity on disc (...) but Barto's is the best modern recording (...). Throughout, you'll notice a wealth of orchestral detail under Eschenbach's direction in an empathetic partnership that brings and ethereal athmosphere to Var 11 and a truly scintillating verve and precision to the final six variations. 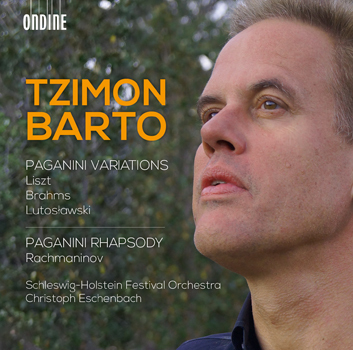 Tzimon Barto is recognised as one of the foremost American pianists of his generation. His new double-CD for Ondine features Paganini variations by three composers, Liszt, Brahms and Lutosławski, as well as the popular Paganini Rhapsody by Rachmaninov. Tzimon Barto is known for his dashing pianistic virtuosity and for his unique artistic personality. Barto also offers enchanting poetic moments on the keyboard, an aspect which is clearly manifested also in this present recording. Niccolò Paganini (1782-1840) was a sensational violinist and composer of his day who inspired many 19th and 20th century composers to write variations based on his 24 Caprices Opus 1, originally written for the solo violin. In this recording Christoph Eschenbach conducts the Schleswig-Holstein Festival Orchestra in Rachmaninov's Paganini Rhapsody. After many years as music director of both the Orchestre de Paris (2000-2010) and the Philadelphia Orchestra (2003-2008), Christoph Eschenbach has held the dual post of music director of the John F. Kennedy Center for the Performing Arts and the National Symphony Orchestra in Washington since September 2010. He has also made numerous recordings both as a pianist and as a conductor. The Schlewig-Holstein Festival Orchestra was founded by Leonard Bernstein in 1987.